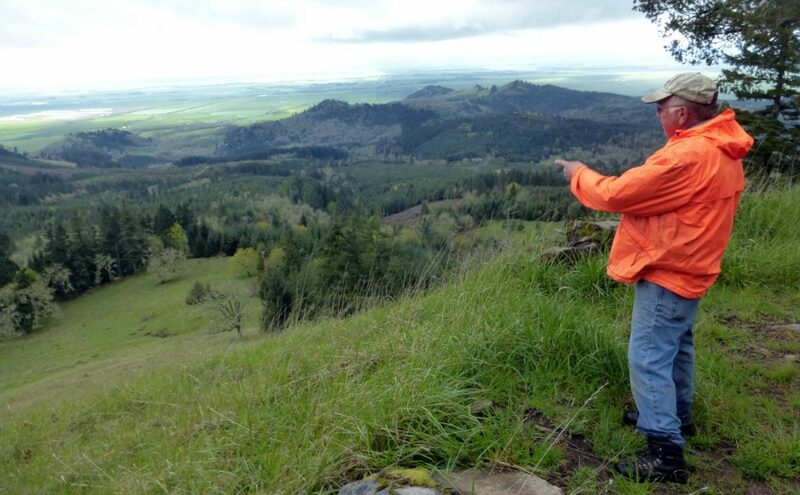 Brothers Jim and Ed Merzenich, along with Jim’s wife, Karen Wilson, steward Oak Basin Tree Farm: nearly 1,000 acres in the Coburg Hills outside of Brownsville, Oregon at the south end of the Willamette Valley. Oak Basin Tree Farm is Forest Stewardship Council® certified through NNRG’s group certificate. The showcase forest is managed for multiple conservation objectives: increasing meadow habitat for for endangered Fender’s blue butterflies, restoring oak woodlands and savannas, enhancing wildlife habitat, and providing a sustained economic return from timber harvests. But the farm’s non-timber products are perhaps its most unusual output. Jim and Ed harvest tree boughs from pruning projects to improve wood quality and collect the needles to distill them into essential oils. While treating overstocked stands they remove small trees and shrubs, and turn the slender limbs into specialty broom handles. 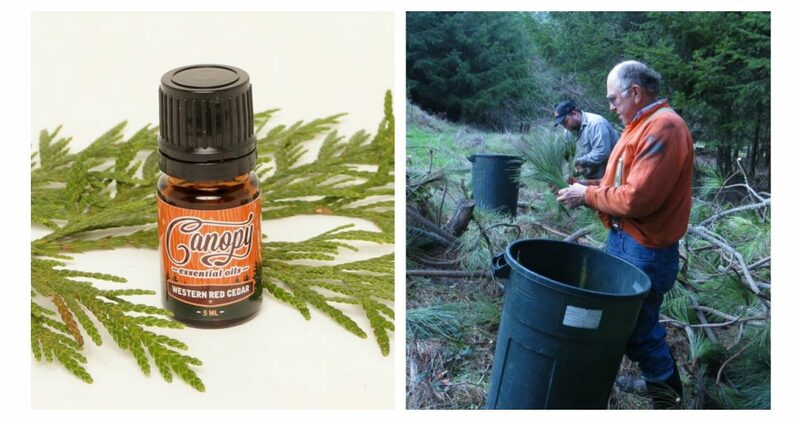 The oils come in several scents: Douglas fir, Grand fir, Noble fir, Western red cedar, Incense cedar, and Ponderosa pine. To make the oils, needles collected from small branches are passed through a mechanical chipper and then poured into a still drum. Water in the bottom chamber of the drum is heated to produce steam, which heats the needles and turns the oil in the needles to gas. The gas and steam mix is condensed, then separated, and finally pure oil drips into a collecting jar. Essential oils from Oak Basin trees are sold under the Oregon Woodland Cooperative product line Canopy Essential Oils. They are available for purchase online. 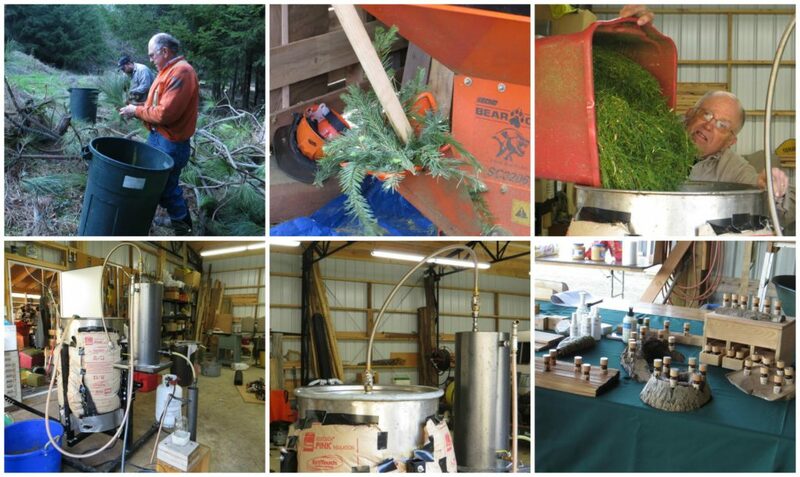 Many thanks to Oregon Woodland Cooperative for the use of their images in this blog post. In our Member Spotlight series, we highlight FSC® certified members of NNRG’s group certificate who have used forest products for unique and entrepreneurial purposes on their land and within their communities. Often these projects help members earn supplemental income.